Previously seen as a sign of weakness, the neck strap is the latest hot new thing in eventing. Big Name Rider William Fox-Pitt wears one. Now everybody must. The goal is to have a piece of leather around the horse’s neck to grab when plans go astray. Back in the dim, dark past, I fashioned one out of a stirrup leather for my first Training Level stadium jumping course. My horse was braided. The rest of the time, I am all about grabbing mane. It’s right there. My horses have never objected. No extra equipment required. When I had to roach Mathilda’s mane one summer due to sweet itch, I left a soul patch right where I might need a handhold. At the risk of the Internet falling down on my head, I must confess that I don’t like neckstraps. They seem unsafe to me. If the horse has a simple strap around the neck on a regular basis, what is to keep said strap from sliding down the neck when the horse lowers her head during, say, a stretchy circle? A moment of inattention from horse or rider and the front foot is caught. What if the horse reaches down to itch a leg? Takes a bite of grass during a hack? Seems to me that remembering to grab onto a strap to keep it from sliding is just one more thing to go wrong. While we are on the subject, I also do not understand western tie-downs that go from girth to nose without benefit of breastplate. This is a foot-tangler waiting to happen. OTOH, I don’t know much about Western tack. Anyone care to enlighten me on this one? Yet, I am not one to sneer at safe concerns. So I bought a yoke. It has a piece that goes through the legs to the girth to keep the neck section in place. Yokes are used at racetracks to attach martingales and as general panic straps. I figure if they can work with hysterical two-year olds, I should be covered. Most of the time. No, it would not have helped me on Milton. There was no time to grab anything. There have been a lot of purchases lately. Husband says he starts to worry about me when I stop buying tack. Post update: Breastplate – I could spin a theory but most I forgot about them. Big in Eventing but not as big in Jumpers, so they fell off my radar. I suspect the whole exercise is moot. Come the heat of the moment, I’m gonna grab mane the way I always have. Fire ants – Burn on contact. Bites take forever to heal. They are the work of the devil. Poor Milton learned about fire ants the hard way. His whole back is covered with devastingly itchy bumps. I suspect he lay down on an anthill. Not a mistake one makes a second time. 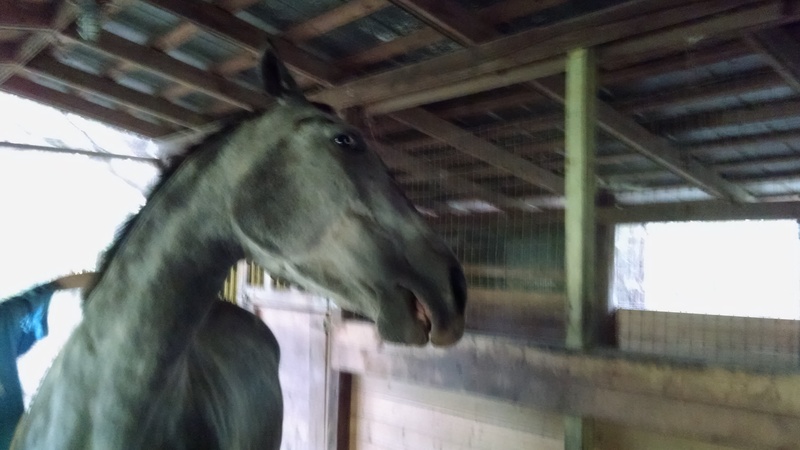 Blurry, but shows how much he cranks his head around when I scratch him. Poor Milton!! Hope he’s feeling better now. Poor dude! Was Rodney hiding behind a tree snickering instead of warning him? Also, totally get a neck strap, but why a yoke and not a breastcollar? like a 5 point that’s attached to the saddle too? The neck straps I see are pretty tight–I can’t really imagine a foot going through them. They set up shop about halfway down the horse’s neck (but then you have to reach forward to grab them, which could set one off-balance) … so I just use mane and/or the 5-point or hunting breastplate strap that goes over the withers. Poor lad. Hazards up this way tend more towards porcupines and … well, actually, I can’t think of anything else. Ice, I guess. The occasional wasp. I always grabbed mane. 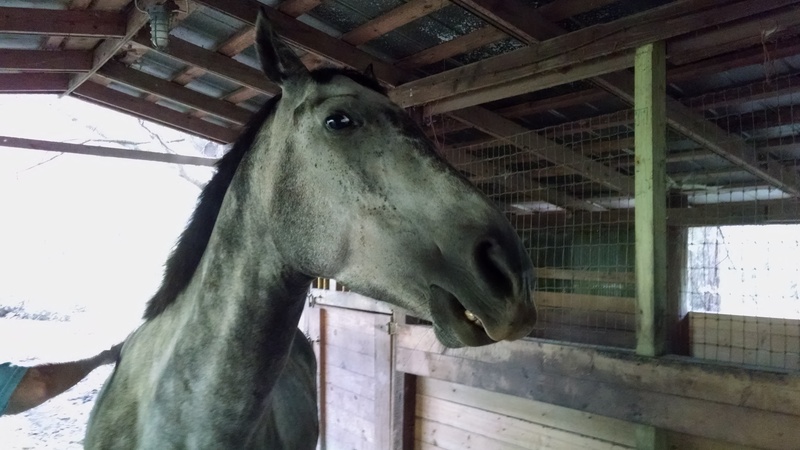 Unfortunately, my mare didn’t have much mane….